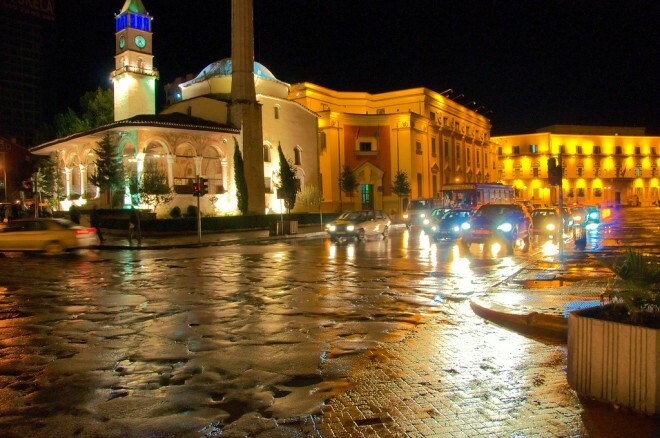 Albania’s capital used to regularly top lists for Europe’s worst city. 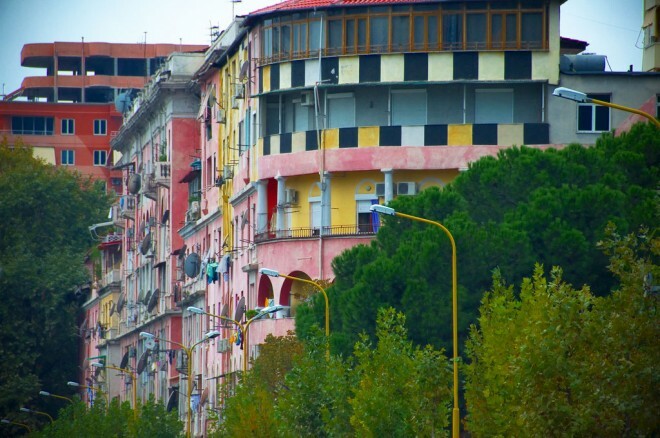 Decades of Stalinist rule left Tirana grey and grim, lacking in both infrastructure and services. The collapse of communism in 1992 only worsened the situation, as chaos engulfed the city and crime started to rise. All that has now changed. Today Tirana is – while still often chaotic – a very pleasant little city, and the cultural, entertainment and political centre of Albania. Home to a rapidly-growing population of nearly one million (Albania’s total population stands at around just three million), Tirana has a buzz you won’t find anywhere else in this beguiling nation. Here are 10 reasons to make a beeline for the Albanian capital. Being invited for a coffee or a rakija (a plum brandy) is a local custom and you’ll find Albanians friendly towards foreign visitors. Having been isolated from the rest of the world for the latter half of the twentieth century, many are curious about the influx of travellers. As it’s a small city, you can easily cover Tirana’s central area in a day. But as well as a leisurely exploration of the handful of museums, monuments, historic buildings and parks, make some time to marvel at the city’s concrete housing estates. Yes, really. Painted in rainbow colours, they add brightness to what was once a rather monochrome cityscape. Albania might not be famed for its cuisine, but that’s no reason not to make food a focus. Look out for the excellent coffee and beer (Islam is the predominant religion but it is practised in a very tolerant way), as well as decent pastries and good gelato. Cafés are the perfect place for people-watching, too, set to a soundtrack of Albanian- and Euro-pop. Tirana’s centre is Skanderbeg Square, named after the national hero who briefly ensured Albania was independent of the Ottoman Empire in the fifteenth century. There is a large bronze statue of Skanderbeg on horseback (imagine Alexander The Great meets Thor) in the middle of the square, and the Et’hem Bey Mosque, one of the nation’s most treasured buildings that dates back to the late eighteenth century, sits in the southeast corner. Also situated here are the nation’s major museums, including The National Historic Museum adorned with a huge socialist mural of victorious partisans. 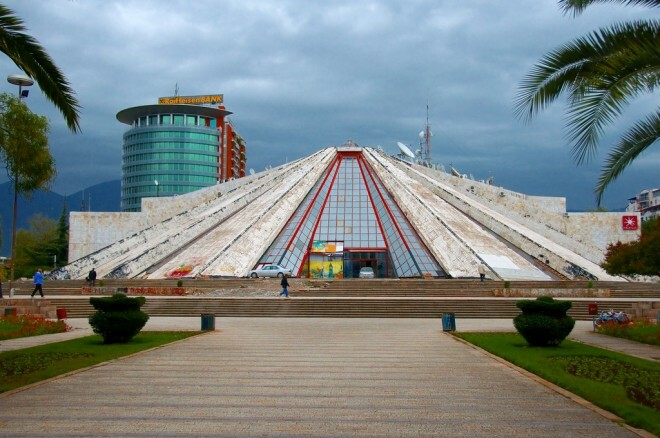 You’ll find Tirana’s concrete pyramid, Piramida, a short walk from Skanderbeg Square. Built in 1987 by the daughter of Albania’s dictator Enver Hoxha (who tyrannically ruled Albania from 1944–85) as a museum to her father, it now sits derelict, stripped of the tiles that once covered it and splattered with graffiti. There is talk of demolishing it, but some argue that it should be kept intact as an apt monument to Stalinism’s ugly spirit. Blloku, The Block, is where Enver Hoxha lived and was once off limits to all but the Communist party’s inner circle. Now it’s the epicentre for Tirana’s beautiful people. Today you’ll find expensive hotels, designer cafés, restaurants and shops. Take in the contemporary glitz from Sky Club, a rotating bar high in the air offering 360-degree views across the city. Tirana’s nightlife scene moves up a notch each year and the city’s clubs, largely situated around Blloku, vary greatly in theme and atmosphere. They are best visited with a local who knows which ones to attend (and which to avoid). Be mindful, however, that Albania is still a traditional society. This large, wooded park is where many of Tirana’s citizens head for a bit of time out, whether it’s fishing in the artificial lake, picnicking on the lawns or kicking-back in one of the many café-bars. Considering how oppressive Tirana’s traffic can get, this park allows the city’s Mediterranean ambience to shine. If you want a break from the city centre, head to Mount Dajti National Park, popular with Tirana’s residents for fresh air and countryside walks. You can either take an Austrian-built cable car (expensive) or the city bus (cheap) and once there you’ll find hotels, guest-houses and restaurants if you feel like staying overnight. The historic city of Durrësi on the Adriatic Sea was, for decades, where the powerful in Tirana went to relax (both Enver Hoxha and King Zog had holiday homes here). These days it’s largely Kosovar tourists who make use of the plentiful cheap hotels and restaurants along the seafront. Things are rough and ready, but Durrësi is lively, inexpensive and easily accessible.